New "Red Protect Rubber Boot" now in. This is the successor/replacement to the original Xtreme Boot, designed expressly for the Inspector Alert. The Xtreme Boot offers maximum performance in a lightweight rugged solution for using the Inspector in the field. The Xtreme boot is designed specifically for individuals operating in tough environments, such as 1st Responders, Mining, and HAZMAT crews. Made of a RoHS compliant TPE rubber, the case also offers superior grip and drop protection. 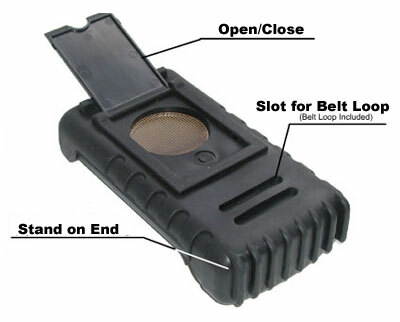 The boot has a matte black finish identical to the enclosure of the instrument for a seamless look, while giving the user complete access to the unit's operation (see photo at right). When using a pancake detector, a protective door opens on the back of the case exposing the GM end window (see photo below. The unit can be stood on end for hands free monitoring of an area. The Xtreme boot is especially designed for use with the Inspector pocket models, but can also be fitted to the Radalert handheld radiation detectors.